Post-Holocaust Germany has built hundreds of monuments to its Jewish past and reconstructed many of its most precious Jewish sites. But one site that is a testament to a vibrant Jewish present has found itself outside these plans. The future of Jewish life in Europe is once more a hot topic of conversation. The mainstreaming of anti-Zionism within European social democratic parties that were once friendly to Israel, and the violence against Jewish communities over the past year in France and Belgium, have rattled the large established communities of Western Europe. At the same time, however, the quiet growth of communities in recently Judenrein Eastern Europe—supplemented especially by Russian and Israeli immigrants—continues apace. Neither of these trends is as new as it seems. Throughout its history, European Jewry has gone through cycles of destruction and rebirth. On a recent visit to Germany, I saw a place that seemed to reflect this entire process in microcosm. If we are to regard Ashkenazi Judaism as a civilization, then the cradle of that civilization would be found floating down the Rhine in the 11th century among the communities of Speyer, Worms, and Mainz. They are collectively known as Kehillot Shum, after the acronym for the three towns, known in Hebrew and Yiddish as Shpayer, Warminsa, and Magenza. Earlier this year, the German government submitted an application to UNESCO, asking the organization to recognize Kehillot Shum as a World Heritage Site. The application notes five sites of particular importance—the Jewish cemeteries in each of the three towns, and the ancient synagogues of Speyer and Worms. 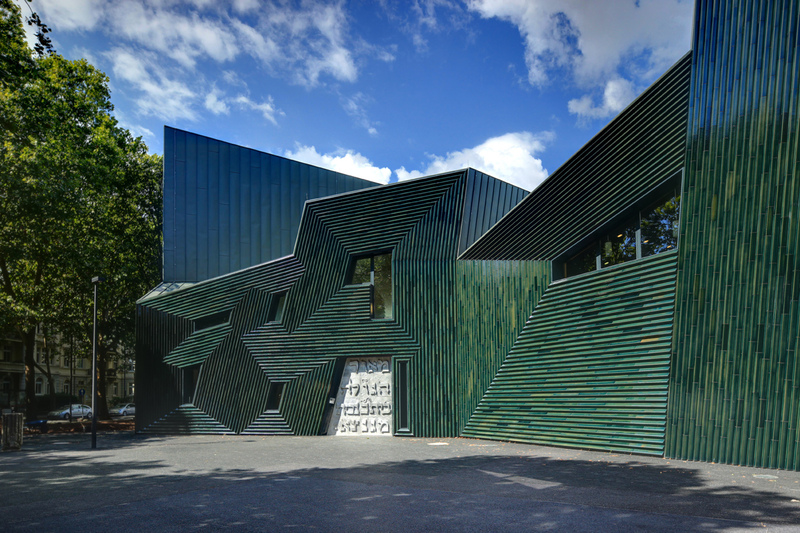 The new synagogue of Mainz, a stunning piece of contemporary architecture, was not on the list. That the Worms synagogue is on the list makes sense on one level, but is also somewhat ironic. The site is certainly an authentic medieval treasure, a temple of legendary scholarship and architectural ingenuity. Its 13th century women’s synagogue was the first of its kind. In 1842, it took down its mechitza—the traditional dividing wall between male and female worshippers—an unusually progressive move for its time. The synagogue itself, however, is no ancient relic. It is a modern replica, made necessary by the fact that the previous synagogue was completely destroyed on Kristallnacht in November of 1938. Pictures on display in the small museum behind the restored synagogue show that when reconstruction began there was nothing to reconstruct. The site was empty. 1938 was hardly the only time the Worms Synagogue knew destruction and rebirth. A story no one seemed to want to talk about was a firebomb attack that took place not 500 or even 50 years ago, but in 2010. No one has ever been arrested or charged. Indeed, stories about the destruction of the Worms Synagogue go back centuries. When I first started researching Worms, I came across a lengthy article about the rebirth of Worms’ Jewish community and the rebuilding of its synagogue in the aftermath of anti-Semitic violence. But the events it referred to were the infamous Worms Massacre of 1096 and the burning of the entire Jewish Quarter in 1348. The article was, in fact, a Jewish Encyclopedia entry from 1906, a mere 32 years before the synagogue would be destroyed once again. The 1096 massacre by rampaging Crusaders on the way to the Holy Land, accompanied by similar events throughout Kehillot Shum and beyond, left one of Worms’ most lasting contributions to Ashkenazi civilization—the Av Ha-Rachamim prayer. Over the centuries it has become a general prayer of remembrance for all Jewish martyrs. Indeed, a wayfaring chronicler could amble through Worms and tell a tale of Jewish destruction and rebirth that would be accurate for the 12th, 14th, 18th, or 20th centuries. During my visit, I saw the latest rebirth, with the previous ones evident as an architectural palimpsest. I can only speculate—pessimistically, perhaps, and a bit mischievously too—how someone one or two hundred years from now might interpret the resurrection I witnessed. I made my way down the crescent-shaped Judengasse Street, the historic heart of Worms’ Jewish Quarter even after the ghetto walls came down. The façades of the buildings matched the gentle curve of the pedestrian thoroughfare, allowing the visitor to see only a few houses at a time. It made the nearly empty street seem even emptier. I followed the curve of Judengasse to the sound of heavy electronic music booming out of an open window. Further along, however, the electronica faded, only to be replaced by the sounds of an unseen children’s choir rehearsing the Hebrew hymn Ya’aseh Shalom. Who was singing? By this point, I was standing opposite the restored synagogue’s courtyard. But the voices weren’t coming from inside the synagogue, which was empty except for a few quiet tourists. The voices seemed to be coming from a municipal building of some kind. Were children from the town’s miniscule Jewish community using the center as a Sunday school? Were non-Jewish Germans, perhaps members of the Warminsa Society for the Promotion and Preservation of Jewish Culture, desperately breathing life into a dead civilization by learning to sing in Hebrew that “He who brings peace in the heavens will bring peace upon us”? Did they think that He could do that for them? Behind the gate on the opposite side of the courtyard lay the synagogue and the museum, as well as an excavated mikvah, a ritual bath dating from the 12th century. But I didn’t need carbon dating to estimate the age of the monochrome pamphlet in a display case at the entrance to the museum. The small-print MS-DOS filename at the bottom of each one gave it away as a product of the ‘80s or ‘90s. Even more of a giveaway was the sentence, “Nowadays, there is no Jewish community in Worms.” In fact, there is a Jewish community in Worms, and the stack of bilingual prayer books in the back of the synagogue is a silent testimony to its arrival. The books are not in Hebrew and German, but in Hebrew and Russian. The rebirth of German Jewry has come from the East. In 1956, when work began on the synagogue, there was indeed no Jewish community in Worms. Nor was there any reasonable expectation that there might be one. The reconstruction of the synagogue was not pursued for the Jews’ benefit, but for the Germans’. It was intended as a bricks-and-mortar manifestation of what was then called Wiedergutmachtung, “making it good again.” The Worms Synagogue may not have been the biggest or most important synagogue in Germany, but it had enormous symbolic and emotional significance for non-Jewish Germans. Suddenly coming to grips with the absence of an entire civilization that had been an integral part of their lives and culture—and which some among them had enthusiastically destroyed—rebuilding this particular synagogue was a reflexive impulse for them, an attempt at some kind of repentance and absolution. Konrad Adenauer, the legendary post-war Chancellor of West Germany, was the driving force behind the reconstruction effort. He even donated to the project from his personal savings. For Adenauer, the site had personal resonance. A full decade before the Nazis rose to power, a young Adenauer was mayor of Cologne, and opened a “Thousand Year Exhibition of the Rhineland” that dedicated special attention to the Jewish community of Worms. Today, that Jewish presence is mostly gone. 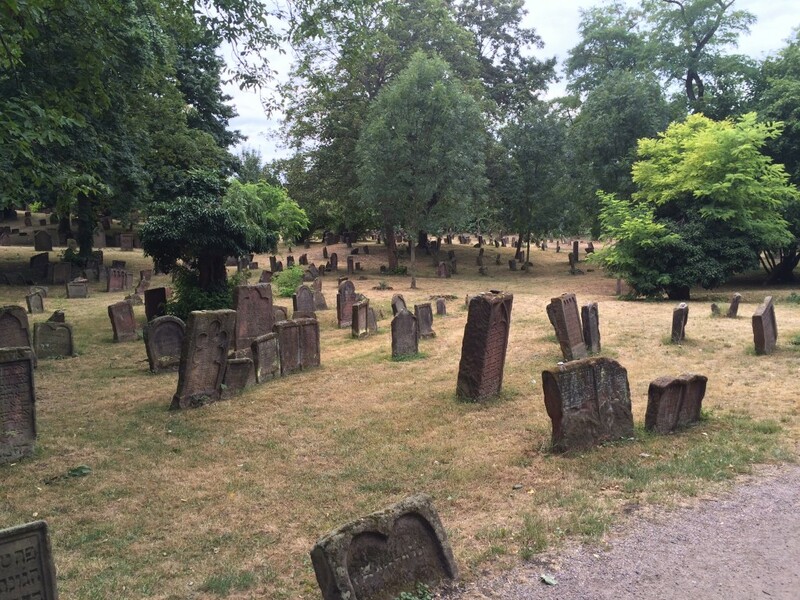 But the Jüdischer Friedhof, the beautiful Jewish Cemetery of Worms, has survived. There, one can trace the passage of centuries. The oldest tombstones are austere, but they become more mystical over time, and the most recent display as much German as Hebrew. It is in the center of town, in a tight cluster off the Judengasse, behind a gated courtyard prominently signposted for tourists, that one encounters the synagogue complex. The first thing one sees upon entering the courtyard is an impressive sculpture of the medieval rabbi Rashi by the artist Wolf Spitzer. This also has a certain irony to it. Exaggerated stories of Rashi’s time in Worms have long been a part of the town’s self-promotion. All we know for sure is that he spent about five years in Worms beginning in 1060. But legends about the famous rabbi abound. One of them even has Rashi’s pregnant mother hiding in a hole in the synagogue wall during the Worms Massacre. The wall in question belongs to a structure built well after the event, and the massacre itself occurred nearly half a century after an adult Rashi left Worms. In fact, the tale seems to have been adapted from a legend that, until the 18th century, was told of an entirely different rabbi. But Rashi’s brief sojourn was so central to Worms’ reputation among the Jewish communities of Shum that even an apocryphal tale was considered kosher. And not just for Jews. Dr. Joseph Bamberger, a historian of medieval German Jewry, relates that, by the 19th century, Worms was promoting itself as the city of both Martin Luther and Rashi in a successful gambit to draw tourists. The connection to both men relied on historical memories that were as selective as they were charitable. Rashi’s time in Worms was brief and little noted by contemporaries, but in the mid-1800s the municipality saw fit to christen one of the Old City gates as the “Rashi Gate.” Martin Luther certainly did face down the Diet of Worms in 1521, even if the defiant cry attributed to him, Hier stehe ich (“Here I stand”), is widely believed to have been invented much later. Less heroically, Luther fled the city that same night, fearing he might be executed as a heretic. There is also a notable irony in placing Rashi and Luther side by side, since the latter eventually proved himself a notably savage anti-Semite. The legends surrounding Rashi and Luther have long been debunked. The legends of the legends were part of the point, part of the attraction. I could imagine what a 19th-century tourist must have felt when he glanced with a knowing smile at “Rashi’s Gate” and explained to his family that the gate itself looks a few centuries younger than anything Rashi might have seen. I could just as easily imagine a curious German Jew asking to see where Rashi taught, only to be told that he only studied in Worms for five years and, in any case, the place he might have prayed had been long since destroyed. It probably felt a bit like the conversation I had with community leader Stella Schindler-Siegreich. I mentioned in passing that I had heard repeatedly that Konrad Adenauer had attended the rededication of the Worms Synagogue in 1961. “Adenauer? Oh no, Adenauer wasn’t there,” she told me with a chuckle. “He sent Ludwig Erhard in his place.” She was referring to Adenauer’s Vice-Chancellor, who would eventually become Chancellor himself. Eleven years old at the time, Schindler-Siegreich came to the ceremony with her parents, who had just moved to the area after nearly a decade in Israel. There was no organized Jewish community in the region back then, but the few Jewish families who lived there all showed up. So did roughly 40 survivors of the pre-war Worms community who were flown in from around the world. They were all that remained of the more than 2,000 Jews who lived in Worms before the Holocaust. The rush to rebuild in Worms stands in stark contrast to the situation in Mainz, where a post-war Jewish community began to take shape much earlier and is still much larger. Building a synagogue in Worms was a German affair. The presence or absence of Jews was orthogonal to any practical consideration. The Germans of the 1950s felt that something essential to their lives had been taken and they were determined to replace it. 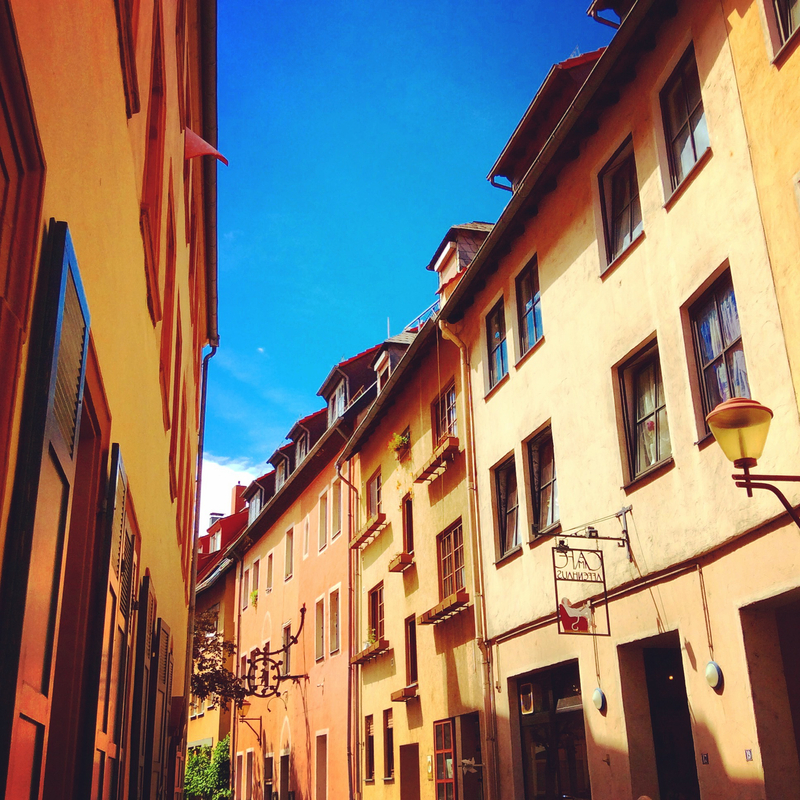 Mainz, on the other hand, is home to a living Jewish community that rebuilt itself. 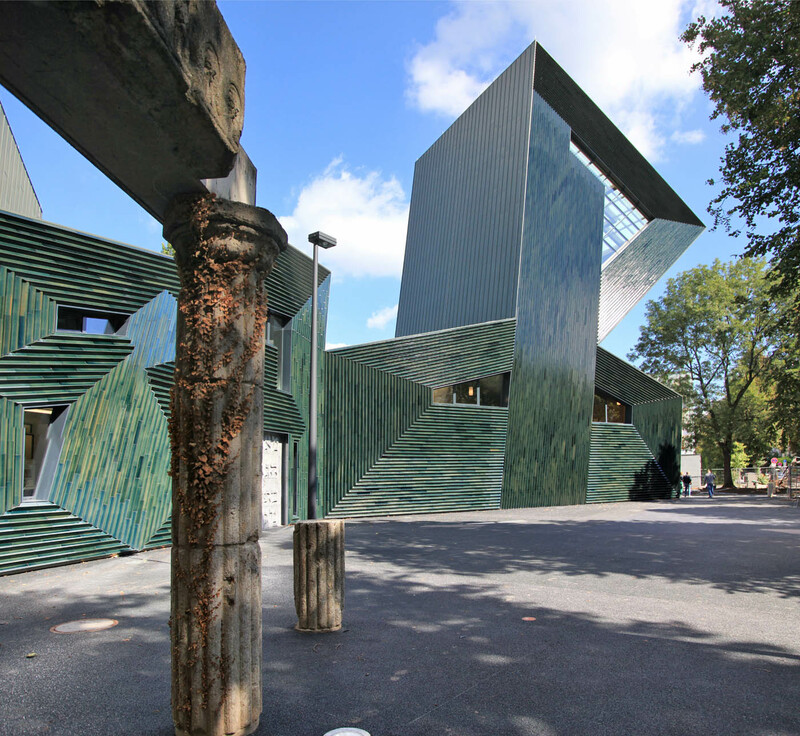 Mainz never had one iconic synagogue to rebuild in an architectural act of Wiedergutmachtung. When Nazism hit Mainz’s Jewish community in the 1930s, it contained roughly 100 synagogues. None survived. When the community looked for a site for a new synagogue in the late 1990s, they didn’t pick the site of the old central synagogue. The site had long since been reused, and many were concerned that the now fully pedestrianized city center wouldn’t be accessible. But they didn’t pick a random site with no connection to Mainz’s Jewish past either. They selected a lot where a large Reform temple had stood before the war. A few columns survived the Temple’s destruction in November 1938, and these were erected just outside the new synagogue. But that’s the only nod to the past on this patch of land. The new synagogue could not be any more disconnected from history. In fact, it’s barely tethered to the present. A large, bombastic structure, it stands out from the monotony of its neighborhood and is visible from blocks away. Dr. Bamberger, a rare but vocal critic of the new synagogue, considers it unnecessary for such a small and struggling community. He estimates that the biggest turnout it gets is on the annual commemoration of Kristallnacht, and laments that what was once a large civic commemoration has been moved indoors. The synagogue itself was designed by the German-Jewish architect Manuel Herz. Not yet 30 when he got the commission, Herz beat out several better-known competitors with his proposal. 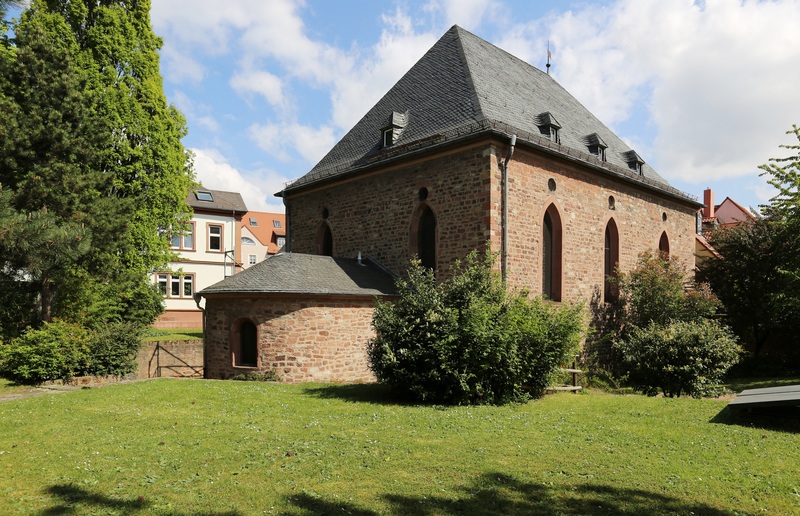 There were delays and setbacks along the way, and construction was difficult due to the structure’s complete lack of straight walls, but the synagogue today is a major draw for visitors to Mainz. Like the synagogue in Worms, it is a loud and only partly intentional statement about Jewish life in Germany. In Worms, it was crucial for the Germans to rebuild something as quickly as possible. In Mainz, 65 years passed between the end of the war and the dedication of the new house of worship. Where Worms is a faithful reproduction, Mainz is brashly new. Where Worms is medieval, Mainz is post-modern. Where Worms is a statement by Germans to themselves, to the world, and even to the Jews; Mainz is a statement of the Jews, by the Jews, and for the Jews, with a hopeful German audience in the background. In a neighborhood of dreary block housing, the bold, sleek lines of the new synagogue shout to the heavens in Hebrew. Literally. The top of the building is composed of the Hebrew letters that make up the word kedusha, “holiness.” The large letter kuf gives one edge of the edifice additional height, and it is there that the actual synagogue is located. The rest of the building serves as a community center. Mainz’s rabbi, Aharon Ran Vernikovsky, is particularly pleased to conduct services in the kuf, because it makes him feel as if he’s inside a giant shofar. When I spoke to him, he was keen to emphasize that the letters do not only make up the outline of the building, but are embedded into the interior walls. This “sea of letters,” as he calls it, is a reminder of Mainz’s historical importance as a center of medieval Jewish scholarship. Mainz cannot market itself with exaggerated tales of Rashi, but its appeal is far more historically verifiable. It was the home of Rabbi Gershom Ben-Yehuda, also known as Me’or Ha-Golah. The new synagogue is named for him, with good reason. Rabbi Vernikovsky praises him as a pioneer of women’s rights. It was his 11th century synod that ended the practice of polygamy among Ashkenazi Jews and decreed that a divorce can only be granted if both husband and wife agree to it. Rabbi Vernikovsky was keen to impress on me one additional architectural feature of the Mainz Synagogue. It wasn’t just the letters he wanted me to notice, or the shofar-shaped hall, or even the ancient columns. It was the flagrant asymmetry of the entire structure. This jagged quality seems to personify the story of the Mainz community and, for that matter, German Jewry itself—awesome, impressive, unpredictable, catastrophic, but present. Worms and Mainz and their synagogues are a testimony to the cataclysmic upheavals of Jewish life in Europe, but also its capacity for rebirth. In Worms, the very nation that annihilated its Jewish population labored to resurrect its most important shrine. 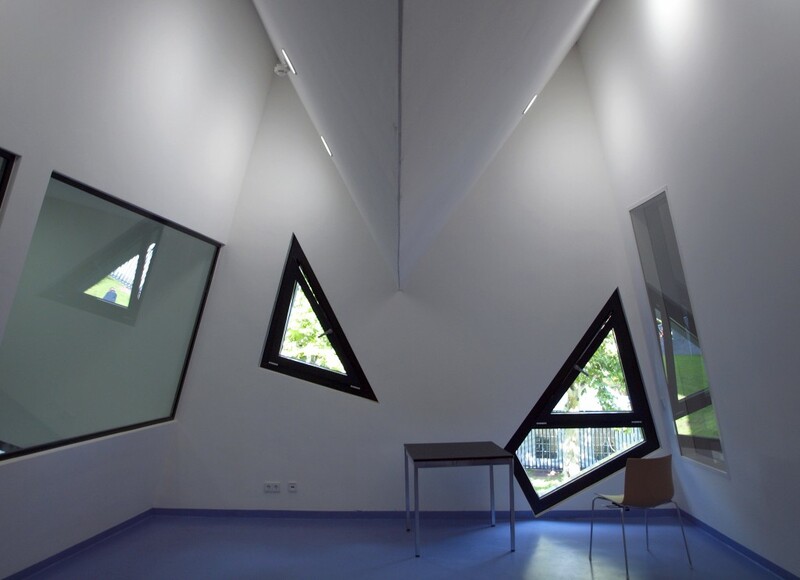 In Mainz, the Jewish community regenerated itself and rebuilt its house of worship as a testimony to its resilience. This epic and ironic juxtaposition speaks to Europe’s own relationship to its Jews. It is one of love and hate, destruction and rebirth, violence and repentance. But it also speaks to the Jewish capacity to renew and rebuild itself even in the face of extraordinary catastrophe. Looking at Europe today, one fears that another in a long list of disasters may be on the way, but one is also moved by the extraordinary resurrection of Jewish life in precisely those places where disaster has struck so often and at such terrible cost.